I don’t get excited about breakfast since it is the meal that takes stomach space and money away from lunch and dinner. However there are a few exceptions that deserve discussion. In my book donuts go with any meal but for some reason they seem most associated with breakfast. With that disclaimer, here is the downlow on DK Diner and their donuts. Many people I know rave about DK Diner as a breakfast and lunch spot. Their reasons vary but the good feelings about the place are consistent and persistent. The common thread in all discussions is DK Diner donuts. People LOVE them. I was a bit skeptical about this. How could a place that is not a bakery or a donut specialist make such a drool worthy fried dough product? I am not sure of the how or why but I do know this, these are the best donuts in Franklin County. DK Diner is a small place in Grandview. Looking at the building, it’s past life was probably as a garage or gas station. The inside seats about 40 and the interior would best be described as nondescript diner decor. One wall is plastered with propaganda from community sports teams and schools. Eating here is a lot like eating at a friends house. Service would best be described as a relaxed version of laidback. The staff seem to be hanging out here as much as working. Beverages are all self-serve and the orders come flying off the grill so fast you don’t even have time to establish a bond with the employees. The breakfast and lunch are served here is standard diner fare. I did stick around for breakfast. I tried the DK All the Way which seemed to be the best way to gauge the quality of the food since it features about 1/2 of their menu. 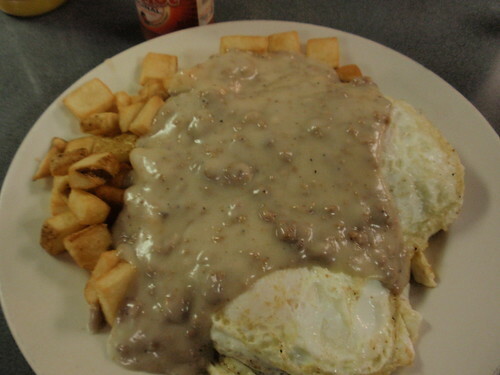 This dish consists of two soft chewy biscuits, each topped with a slice of ham and a fried egg covered with sausage gravy and surrounded by home fries. This was quite good. However it is time to get back to the donuts. Damn, those donuts were good! During my time at the counter I noticed one common denominator among every customer. They each ordered a lot of donuts. There is a small selection of donuts by the cash register. I doubt there are ever more than 100 in the display case at any time. The selections include (the varieties are unmarked): blueberry, cinnamon, cruller, old fashioned cake, cream filled, Devils Food and maybe a few others. 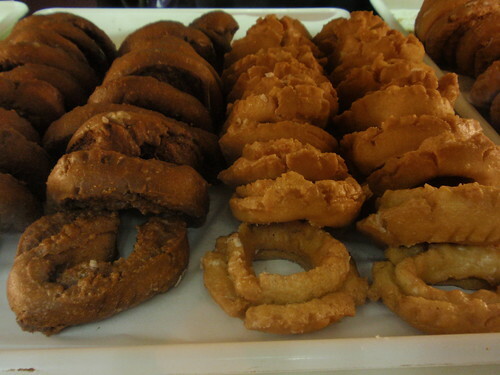 These fresh fried pastries appear to crafted in small batches. They would best be described as irregularly shaped (in some cases deformed), each one looks different from the other unlike the more uniform appearance I have seen at any other donut shop I have visited. The donuts are dense and chewy with a perfect crispy, crunchy crust on the outside. Somehow looking at these unassuming handmade pastries I knew they were going to rock my socks off. I ordered one of each and spent the next twenty four hours sampling them looking for evidence that they were not the best donuts I have ever had. Exhaustive research on my part could only conclude that these are indeed the best donuts in central Ohio. I appreciate the public service that DK Diner offers by serving meals to the community but if they want to focus exclusively on donut sales that would be OK with me. My favorite of the box was the old fashioned cake donut with chocolate frosting and peanuts. I would really like to have one right now. Ummm donut….. This entry was posted on January 19, 2010 at 1:45 PM	and is filed under bakery, breakfast, Diners, donuts. 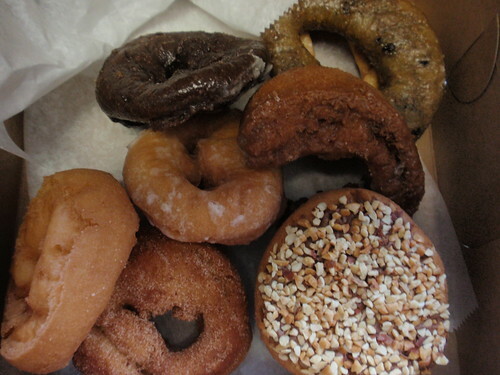 Tagged: Best Donuts in Columbus, DK Diner, DK Diner donuts, ohio donut trail. You can follow any responses to this entry through the RSS 2.0 feed. You can leave a response, or trackback from your own site. Yeah! I’m so glad you went there! Makes me want to visit it again. A point of reference about where the donut expertise came from… DK Diner was once named the Donut Kitchen – that was how they got their start. Thanks for the post, now that lousey orange I ate for breakfast feels even more unfulfulling! In the 1960s, this building was a Lawson milk retail store, I believe. This is correct, it was originally built by Lawsons and it was a convenience store which featured their dairy products. Several were built across Columbus in the 60’s and some still exist as different businesses. The ones in the corner with the nuts are called Persians. At least they were at Young’s JD. A cinnamon doughnut covered in chocolate or vanilla frosting and chopped nuts. I spent many an early Sunday morning frosting them. (12-14 dozen) For giggles, I use to make my own version- maple icing with pecans and peanut butter frosting with chocolate sprinkles. When they are still warm out of the fryer and the icing and chocolate melted together it is pure heaven! Thanks for that memory! oh my god can’t wait to try these!! also, it’s good for me as your self-appointed matchmaker to know you are going so cheap – i’ll let the ladies know 3 persians is all it takes. CMH G. Comment: Two donuts would make me seem cheap or easy and that is not how I roll. I am worth over $2 and I am sticking with that. I knew that the DK All the Way couldn’t bring you down… I’m a big fan of their sausage gravy. I just get the donuts to go at the end. The blueberry and long johns are my favorites. My favorite donuts in Franklin county are from the Tremont Goodie Shop. CMH G. Comment: Good News, the Tremont Goodie Shop was recently purchased by an owner from the original family that owned and operated the spot for years and they have the second best donuts in town. I haven’t tried the DK Diner donuts, but its hard to imagine a donut better than the Goodie Shop donuts (now re-opened and better than ever). 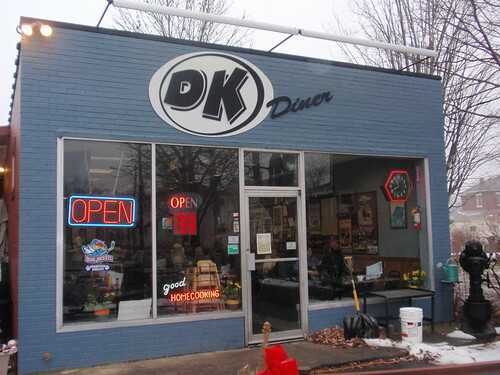 I’m going to try DK Diner this weekend and will post back! I was pretty sure I’ve eaten here on Sunday and a call to the store reveals they are in fact open on Sunday. My wife and I live about a block away and come here for Saturday or Sunday breakfast fairly regularly. Their donuts are outstanding. My favorite menu item is without question, the “Mess.” Corned beef hash with two-eggs on top plus onions and peppers. Some hot sauce and a donut as a appetizer… that’s breakfast!